The P.S.N.I. has received more than £16m in funding to help prepare for when the United Kingdom leaves the European Union on March 29, 2019, it has been confirmed. The Northern Ireland Office (N.I.O.) made the announcement and said the funding had been requested by the P.S.N.I. The money is to be used by the PSNI to help prepare for Brexit. Secretary of State for Northern Ireland, Karen Bradley, M.P., said the extra funding would help address the unique issues that could face Northern Ireland as a result of Brexit. 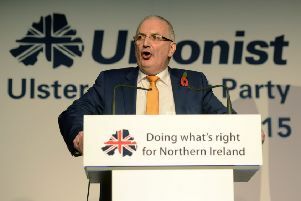 The funding will help to control "pressures and contingencies arising from EU exit preparations, reflecting the specific and unique concerns in Northern Ireland," said Secretary of State Bradley. "The UK Government has invested significantly in the PSNI, with over £230million of additional security funding over the course of the 2010 Parliament and £131million over the current spending review period," she added. This announcement comes less than 24 hours after Defence Secretary, Gavin Williamson, M.P. told the House of Commons that 3,500 British service personnel were on standby should a No Deal outcome become reality. British Prime Minister, Theresa May, will put her exit plan before the House of Commons the week beginning January 14, 2019.